There had, once, been an overland trading route between mainland Teren and neighbouring Exuria, up and through the mountain passes. Its increasing unreliability (for which read, tendency for large rocks to fall on people at regular intervals), just over three hundred years ago, had been what drove Rufus Marek and Eli Beckett’s expedition into the swamps, seeking a route around the mountains. 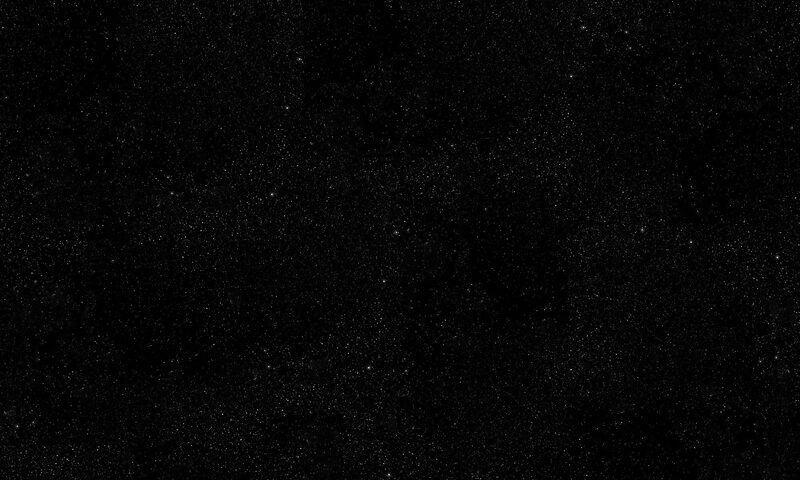 What they’d found was the outlet to the Oval Sea, which had seemed to them nearly as good and possibly better – after all, who else might be there across the sea? Could Teren now trade directly with Exuria’s overseas partners? Just as Marek and Beckett were considering how to go about turning their swamp-going barges into something sea-worthy, along came the Salinas, with their ships, their extensive trading partnerships around the Oval Sea, and their very reasonable carrier prices. Marek and Beckett also made an agreement with an angel to ensure that magic within their new city worked without the need for bloodletting, and that political stability would be protected from magical influence. 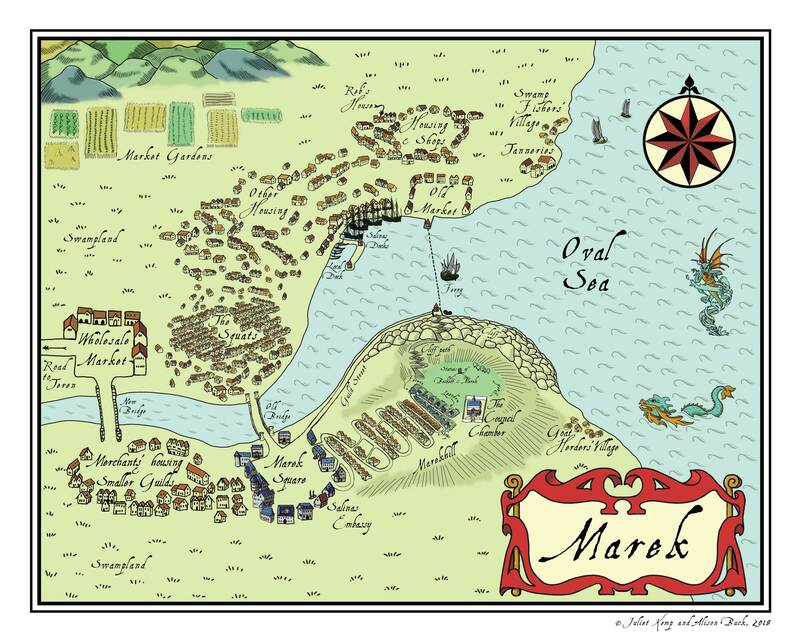 Fairly soon, as the original Thirteen Houses traded and became wealthy, Marek grew from being merely a city and chief trading-port of Teren into a semi-independent city-state. The city is controlled by the Council, which now consists of the Head and Heir of each of the Thirteen Houses, and (a recent innovation) Representatives of the Guilds. As the most significant trading partner, Salina maintains an embassy in Marek. Most sophisticates no longer even believe in magic or the cityangel. 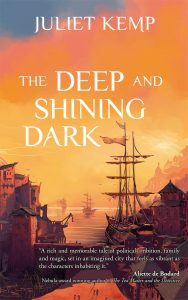 The first book in Juliet Kemp’s gripping Marek series, The Deep and Shining Dark, was published by Elsewhen Press on 6th July 2018. A recent plague wiped out all but two of the city’s sorcerers. Reb, one of the two survivors, becomes concerned when it seems that magic has suddenly stopped working. Soon she is forced to acknowledge that someone has deposed the cityangel without being able to replace it. Marcia, Heir to House Fereno, and one of the few in high society who is well-aware that magic still exists, stumbles across that same truth. But it is just one part of a much more ambitious plan to sieze control of Marek.